DIY throw pillows are great ways to either add to your decor or someone else’s by giving them as a gift. Learn how to make a fun pillow in the shape of a Scrabble game board that you can personalize and customize to fit any room. The trickiest part of this DIY throw pillow is planning out the tile layout of your pillow front. Ashley Hough begins by explaining how to draw a tile board and plan out your words so that everything fits on the pillow and intersects the way you want it to. She then explains what size if letter tile she uses for the pillow front and how to determine what size of pillow needs to be made in order to fit the desired words on the board. Ashley shows an example pillow using her last name but explains how you can customize the pillow to fit any name or you can make the generic pillow she demonstrates using the words ‘happy’, ‘family’ and ‘love’. You can also get more ideas for creative projects to make once you’ve mastered your DIY throw pillow. After the pillow front has been planned out Ashley shows how to construct the pillow front from felt to look like a Scrabble game board by first placing several colored squares in the background and then placing white strips to form the tile squares. She explains how to stitch the strips in place using either a blanket stitch or a zig-zag stitch and shows how securing those strips holds the background squares in place. 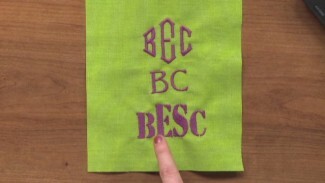 She then explains how the letter tiles are stitched in place as well. 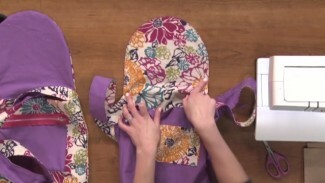 Once the pillow front has been completed Ashley shows how to finish the pillow by creating an easy overlapping back that allows you to insert a pillow form. Once you’ve mastered this fun DIY throw pillow try another throw pillow project!